Last week a giant concrete slab fell from the 26th floor of a skyscraper construction site and crashed into the roof of a sixth story building next to it, destroying the studio apartment of 34 year old Steven Jones. Jones was taking a shower at the time of the accident. If he would have been in his kitchen instead he would be dead. Instead miraculously he only suffered minor injuries. While he was in the shower, Jones heard what he thought was an explosion and walked out of his bathroom to discover a huge hole in his ceiling and thick dust all over. Jones tried to get out of his apartment but the debris was blocking the entrance as well as the fire escape. Firefighters came to the rescue. They were able to clean the debris and get him out of his apartment safely while the rest of the building was evacuated. The slab of concrete fell after the the 26th floor of the skyscraper under construction at 1059 Third Avenue collapsed. The Department of Buildings issued a full stop work order for the site. 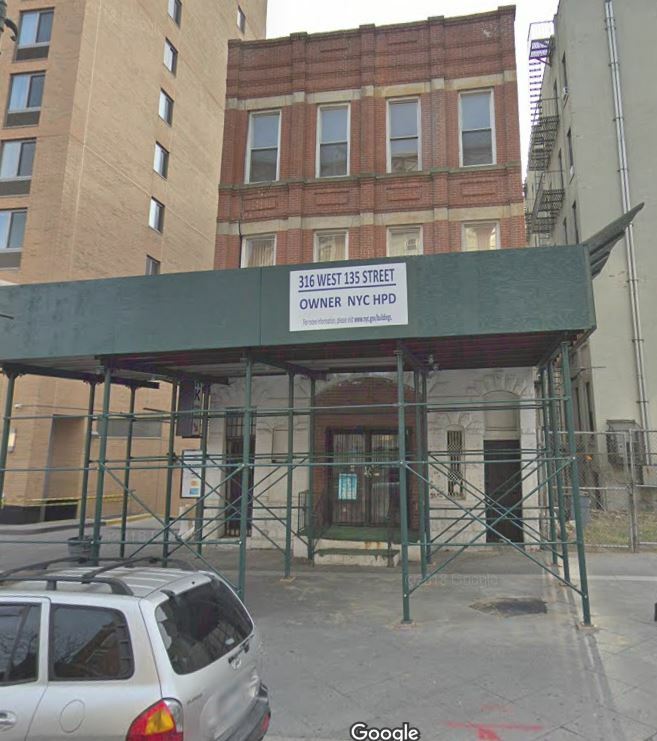 According to their records, a similar accident previously occurred a month earlier and the DOB had already issued a partial stop work order between floors 26th and 30th after debris fell and broke the glass roof of a nearby townhouse. The stop order was lifted after an inspection determined that the violation had been corrected. Apparently the problem was still there. 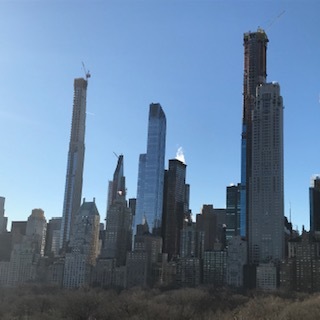 On Monday another freaky accident occurred at a super skyscraper construction site located on 57th Street near Sixth Avenue. An exterior elevator came loose on the 58th Street side of the building and began smashing against the building sending glass and other debris onto the street below. The police closed the entire area for hours. Tenants were evacuated from the top floors of a nearby building. Customers were stuck in restaurants for hours until the heavy elevator that was dangling from the scaffolding 3o stories above the street was removed. Again the worst was avoided and nobody was injured as the cold kept many New Yorkers inside and very few pedestrians were in the street when the accident occurred around 8:00 pm. 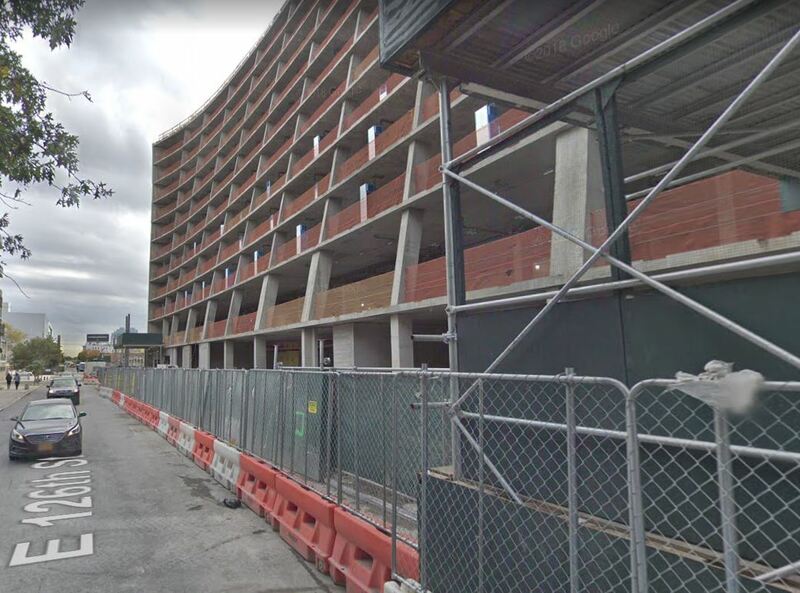 Last June, two construction workers were seriously injured in a mini-crane accident in New York because of the negligence of their contractor, Western Waterproofing Co. Inc from St. Louis (see previous blog). The accident occurred after two supervisors working for the contractor rented a mini-crane, installed it on the fourth floor of the construction site and instructed an untrained worker to lift heavy curtain wall panels with it. The load was too heavy and the crane tipped and fell four stories down. Two workers, Jorge Delgado and Christopher Jackson were seriously injured during the accident. Last week, OSHA cited the Missouri contractor for exposing employees to serious injuries and proposed a $155,204 fine against the company. 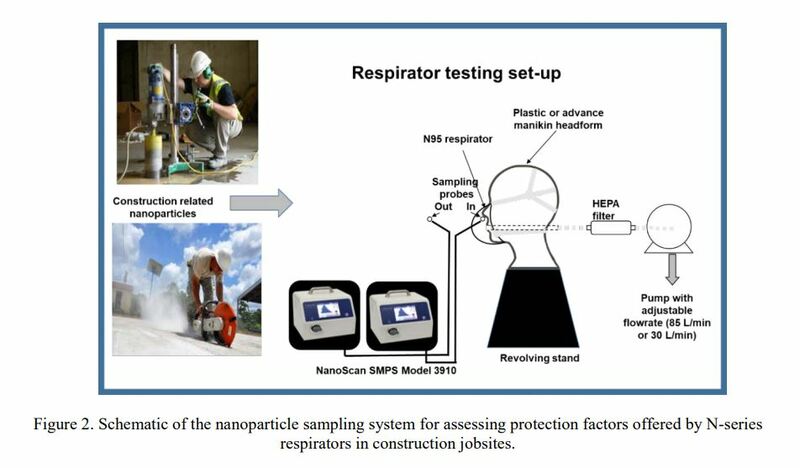 Are construction workers well protected against injuries and illnesses related to nanoparticles? The dust generated on construction sites can have adverse health effects on construction workers. Different activities on construction sites can generate different types of nanoparticles and ultrafine particles that can lead to serious respiratory diseases such as silicosis and lung cancer. To prevent these diseases the NIOSH recommend that workers use N95 respirators. However according to a recent pilot study conducted by the Center for Construction and Research Training (CPWR), these respirators might not protect construction workers properly depending on the task that they execute. The CPWR used two manikins fitted with two types of NIOSH approved N95 masks, the pleated N95 mask and the foldable N95 and assessed their respiratory protection against ultrafine particles and nanoparticles in various construction environments. The researchers first found out that it was very difficult to get the N95 masks themselves as they were out of stock or back ordered for several weeks and substitutes had to be used for the studies. A hard hat died in a forklift accident in New York City last month. 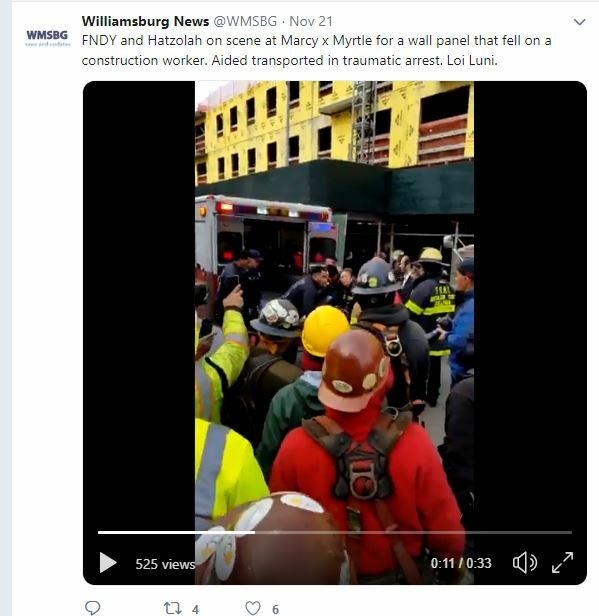 44 year old Over Paredes was working on the construction site of a six-story condo located at the corner of Myrtle Avenue and Marcy Avenue in Brooklyn when a piece of metal-framed wall fell on him. The accident occurred on the rooftop of the building during a day of high wind. The large piece of sheet metal was extremely heavy and was being hoisted by a manual forklift. During the lifting operation, the forklift that, according to a worker, was lighter than the piece of wall, was knocked down onto its side by a gust of wind and the huge piece of wall fell on Paredes. The construction worker died at the scene of the accident despite all the efforts of the EMS to try to rescucitate him. Failure to provide fall protection to workers continues to be the most frequent violation found by OSHA inspectors while visiting construction sites or any other work site of other industries. From October 1st 20017 to September 20 2018, OSHA issued 7,270 violations to employers who failed to provide their employees with appropriate fall protection. Falls are also the number one cause of death on American construction sites. One of the most serious violators was Kasper Roofing & Construction in Florida. OSHA proposed a fine of $134,510 after the death of a roofer. Roofers for this company were working with no protection at all and without any safety training on fall hazards. The second most common OSHA citation was related to hazard communication. Companies using toxic or dangerous chemicals and substances are required by law to proprely identify and label these products. They have to make sure that their employees know about the potential danger of these products by providing them with appropriate training on how to work with or near these products. At the beginning of this month an employee at a drilling company in Alabama died after flammable welding gas stored in an unventilated storage container exploded when he opened the door of the container. The employer, Legend Directional Services LLC, was cited by OSHA for failing to train employees on hazards associated with flammable chemicals. The company is facing a $28,455 fine. Scaffold violations were the third most common violation found by OSHA inspectors. 3,336 companies were cited over the last year for unsafely using scaffolds. The highest proposed fine was $120,320 to Appleton roofing contractor Hector Hernandez. Hernandez employees were neither trained on fall hazards nor provided with fall protection equipment. The contractor also failed to install an extension ladder for safe egress and failed to provide required ladder jack scaffold components. 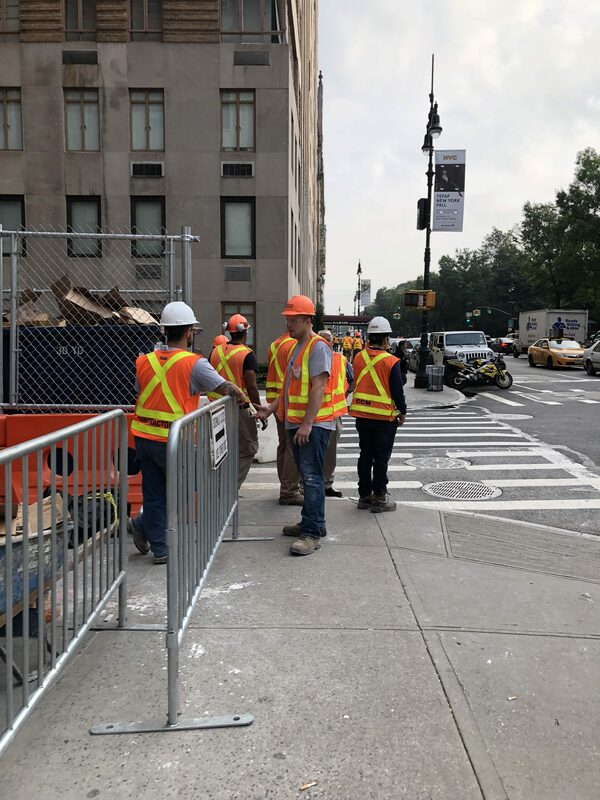 In June 2018 two construction workers were seriously injured in a mini crane accident in New York because of the negligence of their supervisors. These supervisors were indicted last week for their reckless behavior. They face second degree assault and reckless endangerment. The accident occurred on June 25th at a Harlem construction site located on East 126th Street near Lexington Avenue. Workers hired by Western Waterproofing were installing a facade for a building made of stainless steel and giant glass panels. To help them install the panels, 41 year old Timothy Braico, a senior branch manager, rented a mini crane that was installed on the fourth floor of the building. None of the workers in the team had proper training to use the crane and no one knew how to proprely set it up. After the crane was installed without an approved DOB engineering plan specifying crane use and tethering, the site supervisor, 39 year old Terrence Edwards, ordered an untrained iron-worker to operate the crane. The crane maximum load was 880 pounds. As workers were hoisting a 1500-pound glass panel onto the facade of the building, the crane toppled and crashed to the ground. 39 year old Christopher Jackson, was ejected in the air and fell 3-story to the ground. He suffered traumatic brain injury that affected his capacity to talk and walk. Another worker, 37 year old Jorge Delgado was struck in the back and suffered severe spinal injury that affected his mobility. In New York, construction sites using mini cranes have to follow specific procedures in order to legally use them. A permit application that includes detailed plans as well as the proof that the contractor hired a certified operator and certified rigging crew must be submitted to the DOB in order to use a mini crane. From 2008 to 2016 the rate of fatal construction accidents at small construction employers in the US grew by 57% while during the same period it decreased by 30% at construction companies employing more than 20 employees. 37% of the construction workforce is hired by small contractors but they account for 67.2% of all fatalities according to a recent report published by the Center for Construction Research and Training. The construction industry in the US is mostly made of small businesses with 1 to 9 employees. According to 2016 statistics, 82% of payroll establishments in the construction industry had fewer than 10 employees and 9% had between 10 and 19 employees. Which means only 9% of employers are big companies. Big companies usually have better health and safety programs than small construction companies that sometimes struggle with increased competition and have limited resources. To prevent construction accidents in New York, every hard hat in the city is now required to get at least 40 hours of safety training. Safety training as well as constantly promoting and encouraging safety on construction sites is an effective way to reduce injuries and deaths related to accidents. It is not only important that every worker be trained on how to safely work but also that foremen and lead workers promote safety practices and apply them on a day to day basis on their job-sites. 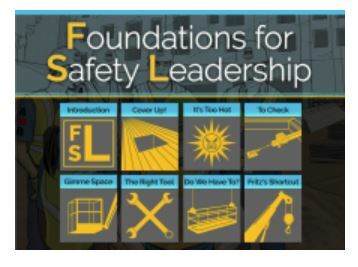 To be effective safety leaders, in addition to the basic safety training, lead workers can highly benefit from specific training such as The Foundations for Safety Learning (FSL). The FSL is a 2.5- hour training module that is dedicated to train lead workers on construction sites. Developed by OSHA and the Center for Construction Research and Training (CPWR) as well as construction workers and other experts, it was initially released by OSHA as a a 30-hour elective module in January 2017. It has now been integrated in the training requirements of many small and large employers.